Almost one-fourth of American adults earn money in the gig economy, and the ones who earn their primary income in the gig economy are much more likely to have anxiety and feel financially insecure than non-gig workers. T­­­wenty-four percent of Americans earn at least some income from “gig” work, such as driving for Uber or Lyft, selling products or services online, or working in some type of freelance capacity. Gig work may be the primary or secondary source of income, and as this study shows, those who rely on the gig economy as their primary source of income are more likely to have high anxiety levels, fear unexpected expenses, and feel financially insecure. The Marketplace-Edison Research Poll is a regular series of surveys that examines how the U.S. population feels about their personal economy and financial situation in the landscape of the larger U.S. economy. The Economic Anxiety Index is a tool designed by Edison Research and Marketplace to measure the amount of stress a person feels about their individual financial situation through a series of twelve questions regarding job security, saving and expenses, and general financial anxiety. Only 24% of those who are employed (not in the gig economy) have an Economic Anxiety Index score over 50. Almost half, 45%, of those who rely on gig work as a primary source of income have an Economy Anxiety Index score over 50. “Our research shows that there are really two gig economies: one where gig jobs serve as the primary livelihood for employees, and one where they provide supplemental income. The 44% of Americans working in the gig economy who depend on gig work as their primary source of income show deep economic anxiety, which merits further study,” said Edison Research President Larry Rosin. 24% of Americans earn some income from the gig economy. For 44% of gig workers, their work in the gig economy is their primary source of income. For 53% of gig workers aged 18-34, their work in the gig economy is their primary source of income. Men are more likely to be employed in the gig economy than women. Thirty-one percent of men say they earn money through the gig economy compared with 18% of women. 31% of Hispanic adults 18+ earn money through the gig economy,compared to 27% of African Americans and 21% of White adults. 45% of those who rely on gig work as their primary source of income have an Anxiety Index Score over 50, compared to only 24% of those employed but not in the gig economy. 80% of gig employees whose gig work is the primary source of income say that an unexpected expense of $1,000 would be difficult to pay. 28% of those who rely on gig work as their primary source of income say they are not financially secure compared to 20% of those employed but not in the gig economy. 51% of gig workers say they work harder for their income than those in traditional jobs. Edison Research conducted a national survey of the United States population aged 18 and older. There were 1,044 interviews conducted via landline phone, cell phone, and online. Interviews specific to the topic of the gig economy were conducted from February 14, 2018 to February 20, 2018. This is the first time that the Marketplace-Edison Research Poll has included questions about earning money through the gig economy. Edison Research (www.edisonresearch.com) conducts survey research and provides strategic information to a broad array of commercial clients, governments and NGOs, including AMC Theatres, The Brookings Institute, Disney, The Gates Foundation, Google, the U.S. International Broadcasting Bureau, Oracle, Pandora, The Pew Research Center, Samsung, Spotify, Sirius XM Radio, and Univision Communications. Edison Research works with many of the largest American radio ownership groups, including Bonneville, Emmis, Entercom, and Radio One. Another specialty for Edison is its work for media companies throughout the world, conducting research in North America, South America, Africa, Asia, and Europe. Since 2004, Edison Research has been the sole provider of Election Day data to the National Election Pool, conducting exit polls and collecting precinct vote returns to project and analyze results for every major presidential primary and general election. Edison conducts more than 100,000 interviews in a single day for this project. Edison provided exit polls and tabulated the national vote across every county in the United States for ABC News, CBS News, CNN and NBC News in the 2018 U.S. elections and will do so again in 2020. 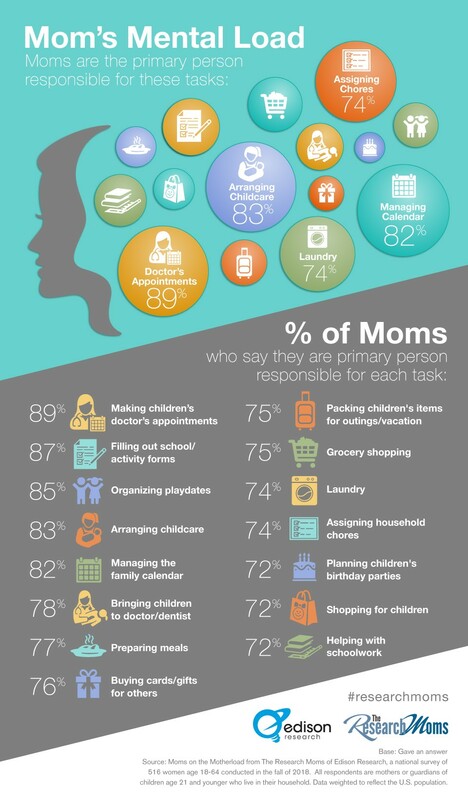 Moms on the “Mother Load,” the latest study from the Research Moms at Edison Research focuses on all the tasks that women do when they are called mom. The physical parenting responsibilities as well as the thinking, organizing and planning all contribute to the mental load that moms carry. The report highlights not only the tasks that are managed, but also how those tasks are shared among co-parents and how moms view that division of labor. For the full Moms on the Mother Load 2018 study click here. Edison Research and Triton Digital released The Podcast Consumer 2018 earlier this year, marking our 10th year of issuing the most extensive analysis of American podcast listeners available. 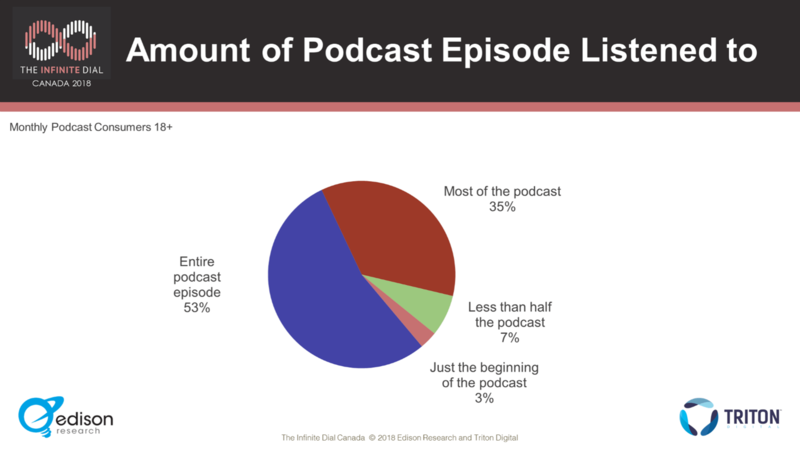 Today Edison and Triton Digital are proud to release The Podcast Consumer Canada 2018. This report includes new, unreleased information on the demographics of podcast listeners, frequency and location of podcast consumption, smart speaker ownership, and other podcast listening behaviors in Canada. Data is derived from The Infinite Dial Canada 2018 by Edison Research and Triton Digital. Podcast listeners have higher incomes and education levels than the average adult. 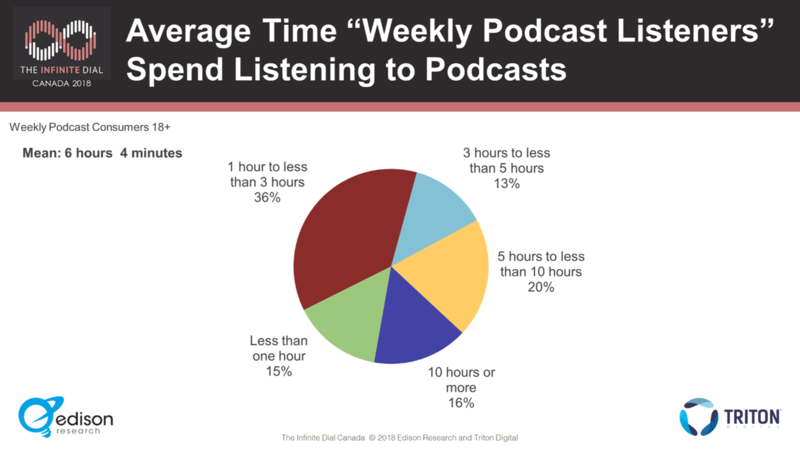 Weekly podcast listeners spend an average of 6 hours per week listening to podcasts. 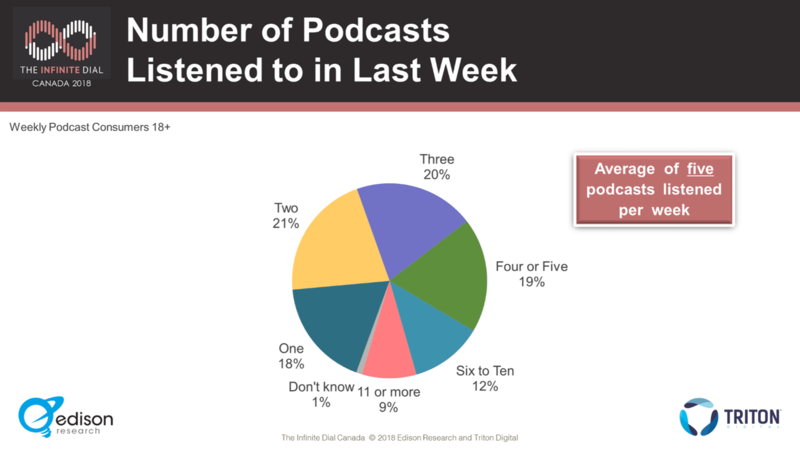 Weekly podcast listeners listen to an average of 5 podcasts per week. Over half of monthly podcast listeners listen to the entire podcast. 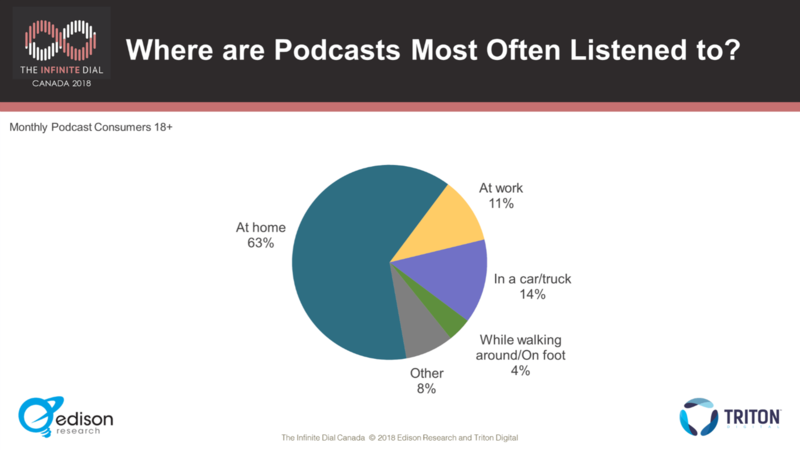 In-home is the top listening location for podcasts. Almost half of podcast listeners listen to podcasts from Public Radio producers. Monthly podcast listeners who also own smart speakers are more likely than average to own an Alexa. Canadians are quite familiar with the term “podcasting,” with 61% of all adults 18+ saying they are familiar with the term. 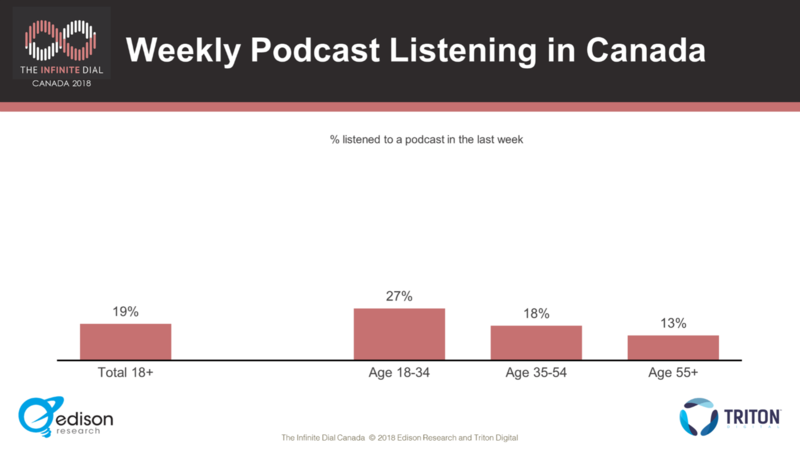 Almost half of Canadians 18+ (47%) have ever listened to a podcast, and the younger the respondent, the more likely they are to have listened. Sixty percent of adults 18-34 have listened to a podcast at some point in time. 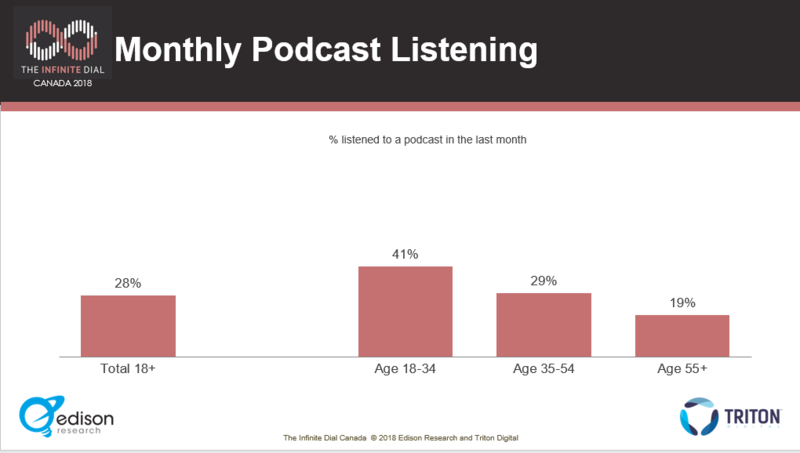 Twenty-eight percent of all Canadian adults are monthly podcast listeners, and the younger the listener, the more likely they are to be a monthly or weekly podcast listener. Forty-one percent of those age 18-34 are monthly podcast listeners. The same holds true for weekly podcast listening, with the younger demos showing a higher concentration of weekly podcast listening. Nineteen percent of adults 18+ have listened to a podcast in the past week, while 27% of 18-34-year-olds are weekly podcast listeners. 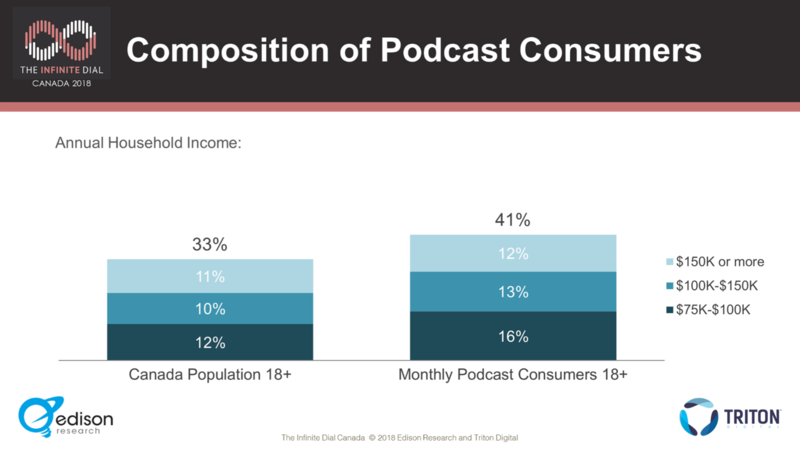 Podcast listeners have higher incomes and education levels than the average Canadian 18+. Twenty-nine percent of monthly podcast consumers have an annual household income of $75K-$150K compared with 22% of the total population. Canadian podcast listeners age 18+ also have higher education levels than the average Canadian adult. 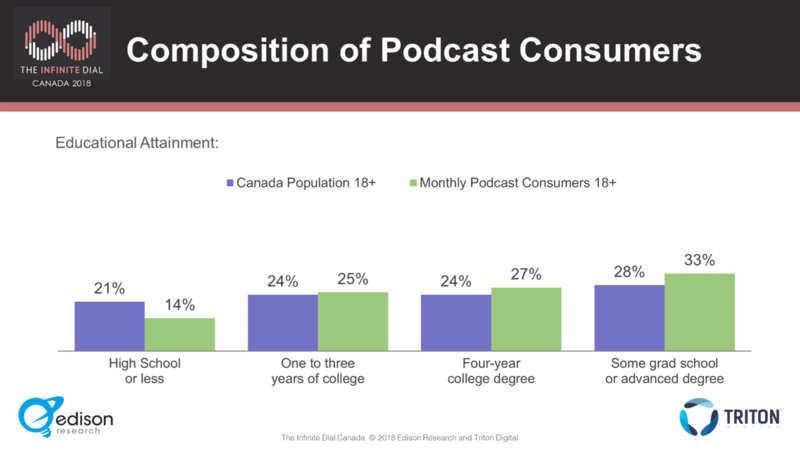 One-third of monthly podcast listeners in Canada have at least some graduate school or an advanced degree, and 27% have a four-year degree. Monthly podcast listeners are much less likely to be retired and more likely to be employed full-time or to be a student than the average adult in Canada. 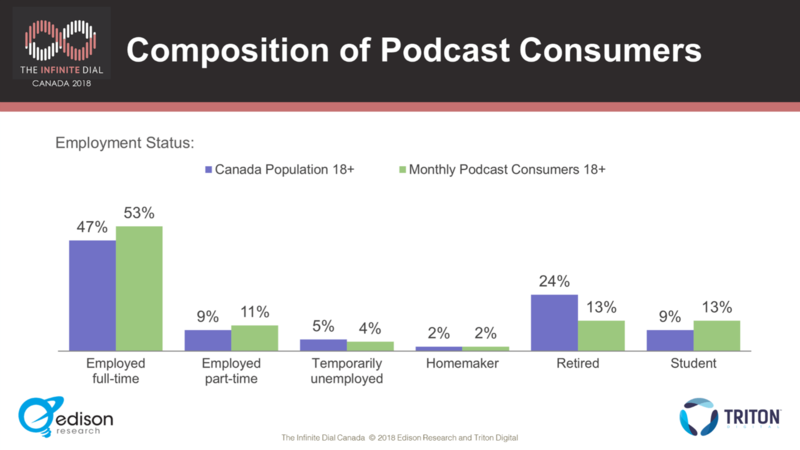 Only 13% of Canadian monthly podcast listeners are retired, compared with 24% of the total 18+ market. Fifty-three percent of podcast listeners are employed full time and 13% are students. Podcasts can range in length from just a few minutes to well over an hour or even two. Weekly podcast listeners spend an average of six hours and four minutes per week listening to podcasts. Thirty-six percent of weekly podcast listeners spend five hours or more per week with podcasts. Weekly podcast listeners listen to an average of five podcasts per week, with 21% listening to six or more in that same period. Over half of monthly podcast listeners say they listen to the entire podcast, while a little over one-third (35%) don’t listen to the entire podcast, but do listen to most of it. Only 10% say they listen to less than half or just the beginning of the podcast. 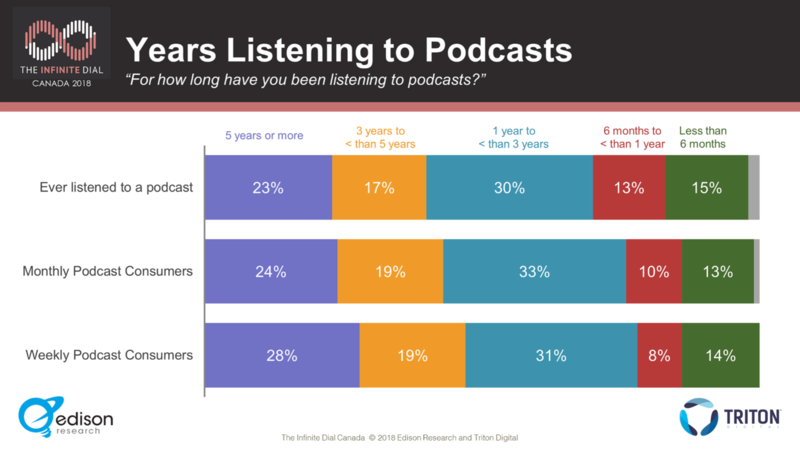 Those who have been listening for the most number of years were more likely to consume podcasts more often. Twenty-eight percent of weekly podcast consumers have been listening to podcasts for five years or more, while 24% of monthly podcast consumers have been listening five years or more. At home is the overwhelming top location to listen to podcasts, with 63% of monthly podcast consumers listening most often at home. In-car/truck is a distant second place at 14% and is close to the number of those who listen at work, 11%. Four percent say they listen while walking around. 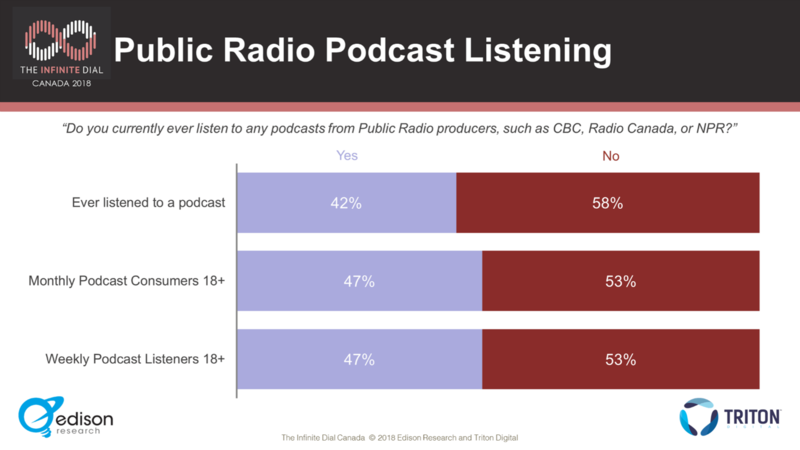 Just under half all podcast listeners (47%), listen to podcasts from Public Radio producers such as CBC, Radio Canada, or NPR. Podcast listeners (10%) are just slightly more likely to own a smart speaker, either an Amazon Alexa or a Google Home device, than the average adult in Canada (8%). Of the podcast listeners who also own smart speakers, they are more likely to own an Amazon Alexa but no Google Home (37%) than the average adult in Canada. 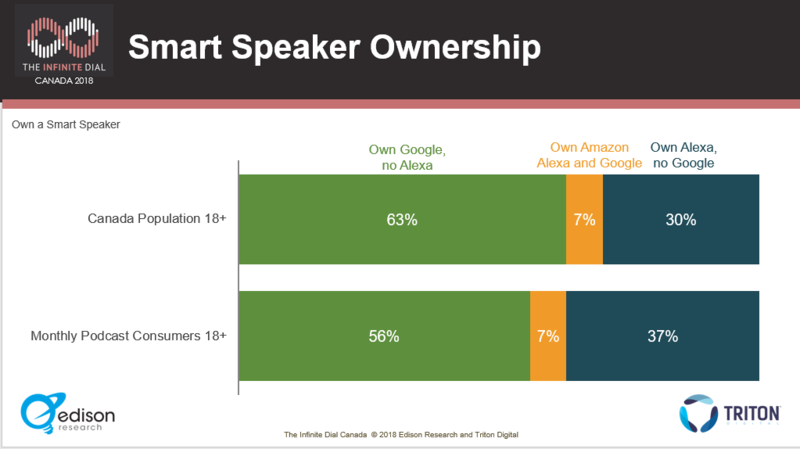 Overall, the Google Home is a more popular choice with 56% of monthly podcast consumers owning a Google and no Alexa compared to 63% of the adult population of Canadian smart speaker owners. 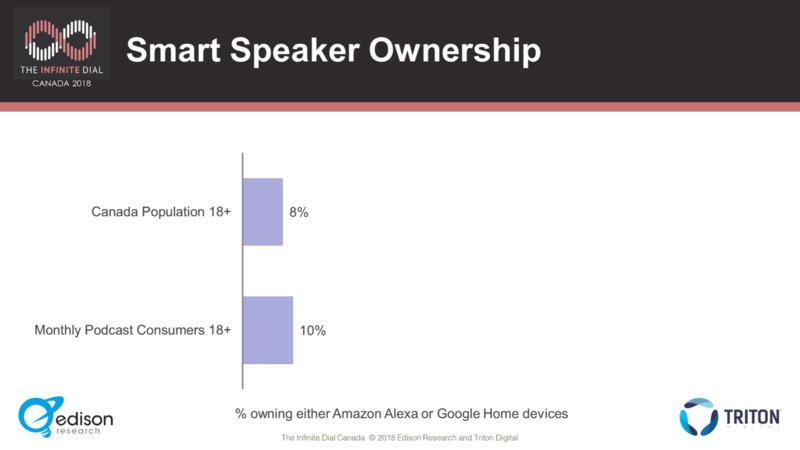 When it comes to Amazon Alexa, though, 37% of podcast listener/smart speaker owners have one compared to 30% of the adult smart speaker owners in Canada. Seven percent of both groups own an Amazon Alexa AND a Google Home. About The Podcast Consumer Canada 2018: In Q1 2018, Edison Research conducted a national telephone survey of 1,000 Canadians aged 18 and older, using random digit dialing techniques to both cell phones and landlines. The survey was offered in both English and French, and the data is weighted to national 18+ population figures. “First adopters” (those who have owned a smart speaker device for more than one year) demonstrate more advanced use of the voice assistant and smart speaker – for instance, using it to control home security and other household devices. By contrast, new, “early mainstream” users (who have owned a smart speaker device for less than one year) are relying on the technology for a wider range of daily activities including ordering food, making calls, getting traffic reports, researching products, shopping, and even facilitating family/social time. “In homes that have had smart speakers for at least a year, they are now the number one device for consuming audio. This has profound ramifications for anyone in media and advertising. For millions of Americans, smart speakers are truly the new radio,” says Tom Webster, Senior VP of Edison Research. The Smart Audio Report from NPR and Edison Research, which debuted in June 2017, is a reoccurring study on trends in Smart Speaker ownership and voice assistant user behavior. A full archive of research from the Report is available here. NPR was the default Flash Briefing provider on Amazon Alexa devices at launch in 2014, and also on Google Home, Microsoft Cortana and Apple HomePod devices. The Smart Audio Report is based upon a national online survey of 909 Americans ages 18+ who indicated that they owned at least one Smart Speaker. The device owner data was weighted to nationally representative figures on Smart Speaker users from The Infinite Dial 2018 from Edison Research and Triton Digital. NPR’s rigorous reporting and unsurpassed storytelling connect with millions of Americans every day — on the air, online, and in person. NPR strives to create a more informed public — one challenged and invigorated by a deeper understanding and appreciation of events, ideas and cultures. With a nationwide network of award-winning journalists and 17 international bureaus, NPR and its Member Stations are never far from where a story is unfolding. Listeners consider public radio an enriching and enlightening companion; they trust NPR as a daily source of unbiased independent news, and inspiring insights on life and the arts. More information about NPR is available here and by following NPR Extra on Facebook, Twitter and Instagram. Edison Research conducts survey research and provides strategic information to a broad array of clients, including Activision, AMC Theatres, Disney, Dolby Laboratories, Google, NPR, Oracle, the U.S. International Broadcasting Bureau, Pandora, Samsung, Siemens, Sony, The Gates Foundation, and Univision. Edison is the leading podcast research company in the world, and has conducted research on the medium for NPR, CBS, PodcastOne, WNYC, and many more leading companies in the space. Another specialty for Edison is its work for media companies throughout the world, conducting research in North America, South America, Africa, Asia, Australia, and Europe. Edison Research is the sole provider of election exit poll data for the National Election Pool comprised of ABC, CBS, CNN, and NBC. Edison is also the leading provider of consumer exit polling and has conducted face-to-face research in almost every imaginable venue. Twenty-one percent of Americans say they have experienced sexual harassment in the workplace: 27% of women and 14% of men say they have experienced sexual harassment at work. Among the 24% of Americans working in the gig economy, 30% of them say they have experienced sexual harassment at work. These are some of the many findings from the recently released Sexual Harassment in the Workplace: #metoo, Women, Men, and the Gig Economy report from the Marketplace-Edison Research Poll. In early 2018, shortly after the #metoo movement gained momentum, Edison Research and Marketplace fielded the latest iteration of the Marketplace-Edison Research poll. This study asked a module of questions about sexual harassment in the workplace, and the results provide valuable insights into this issue among American workers. “The Marketplace-Edison Research Poll has provided unique insights into the lives of the American population for several years, and we recognize the importance of addressing this issue through the survey for the first time,” said Edison Research President Larry Rosin. Among those who have experienced sexual harassment at work, 50% of women and 64% of men agree that the harassment in the workplace hurt their career. Fifty-two percent of those who have experienced sexual harassment in the workplace say they made a job change because of the harassment. Forty-six percent of women and 64% of men agree they changed jobs because of sexual harassment at work. Only 25% of women who experienced sexual harassment in the workplace strongly agree they could report an incident to their employers without fear. Forty-one percent of men who experienced sexual harassment in the workplace strongly agree they could report an incident to their employers without fear. Of those who have experienced sexual harassment in the workplace, women are less likely than men to strongly agree that the incident was handled properly by their employer. Only 30% of women and 53% of men strongly agree that their employer handled the incident properly. Those in rural areas are more likely to have experienced incidents of sexual harassment at work than those in other areas. Twenty-six percent of those in rural areas, compared to 21% in urban and 18% in suburban areas, have been sexually harassed at work. Edison Research conducted a national survey of the United States population aged 18 and older. There were 1,044 interviews conducted via landline phone, cell phone, and online. Interviews specific to the topic of sexual harassment were conducted from February 14, 2018 to February 20, 2018. Edison Research (www.edisonresearch.com) conducts survey research and provides strategic information to a broad array of commercial clients, governments and NGOs, including AMC Theatres, The Brookings Institution, Disney, The Gates Foundation, Google, the U.S. International Broadcasting Bureau, Oracle, Pandora, The Pew Research Center, Samsung, Spotify, Sirius XM Radio, and Univision Communications. Edison Research works with many of the largest American radio ownership groups, including Bonneville, Emmis, Entercom, and Radio One. Another specialty for Edison is its work for media companies throughout the world, conducting research in North America, South America, Africa, Asia, and Europe. Since 2004, Edison Research has been the sole provider of Election Day data to the National Election Pool, conducting exit polls and collecting precinct vote returns to project and analyze results for every major presidential primary and general election. Edison conducts more than 100,000 interviews in a single day for this project. For the 2018 and 2020 U.S. elections, Edison will provide exit polls and will tabulate the national vote across every county in the United States for ABC News, CBS News, CNN and NBC News.